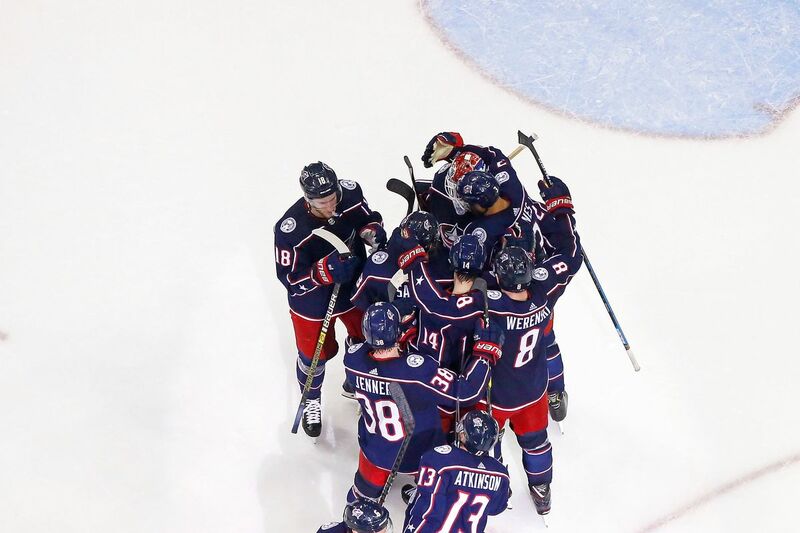 Oliver Bjorkstrand scored the go-ahead goal late in the second period as the Columbus Blue Jackets completed its stunning sweep of the Tampa Bay Lightning with a 7-3 win at Nationwide Arena. It was the first time in franchise history that the Blue Jackets have won a playoff series. Alexandre Texier scored twice and Pierre-Luc Dubois, Seth Jones, Artemi Panarin and Matt Duchene also tallied for Columbus. Cedric Paquette, Brayden Point and Steven Stamkos lit the lamp for the disappointing Bolts, who finished 30 points ahead of Columbus in the standings. Sergei Bobrovsky finished the tilt with 30 saves. The Blue Jackets will face the winner of the Boston-Toronto series next. Speaking of sweeps, the New York Islanders finished off the Pittsburgh Penguins with a typically gritty 3-1 road win at PPG Paints Arena. Jordan Eberle replied 1:34 after Jake Guenztal opened the scoring 35 seconds into the game and Brock Nelson and Josh Bailey also scored for the Islanders. New York goaltender Robin Lehner made 32 saves and stopped 135 of the 141 shots he faced in the series. The Islanders await the winner of the Washington-Carolina series. Kyle Connor scored 6:02 into overtime to give the Winnipeg Jets a 2-1 win over the St. Louis Blues, tying the series at two games a piece. Mark Scheifele tied the game after Valdimir Tarasenko gave the Blues a 1-0 lead early in the third period. Connor Hellebuyck stopped 31 of 32 shots. The road team has now won all four games in the series. Marc-Andre Fleury stopped 28 shots and Max Pacioretty scored a pair of goals in the Vegas Golden Knights 5-0 rout of the visiting San Jose Sharks. Shea Thedore, Alex Tuch and Jonathan Marchessault notched their first goals of the series as the Golden Knights chased Martin Jones after one period. Vegas now leads the series three games to one. On Monday, Aleksi Heponiemi and Karpat defeated HIFK 3-0 to advance to final round of the Liiga playoffs where they face HPK for the league title. Heponiemi logged 15 minutes of ice time and didn’t figure in the scoring or register a shot on goal.